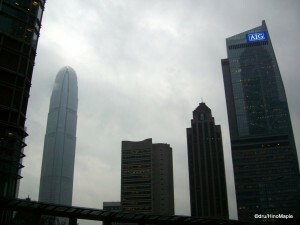 On January 23, 2008, I left Tokyo for a trip to Hong Kong. It was my first trip to the “motherland” since I was in High School. The Hong Kong I remember is nothing more than flashes of the past and nothing more. I was excited to head to Hong Kong and re-visit a place that still feels very foreign to me. While the main reason for me to head to Hong Kong was to re-visit my parents hometown, most of my family would be in Hong Kong at the same time. One of my cousins was getting married and I decided that was my reason to go. The day I left was a very odd day. I took the first Bus to Narita on the first day of snow for the season. I was sad that I wouldn’t be able to see more snow, but I was heading to Hong Kong, so it was okay. The flight to Hong Kong is roughly 5 hours, but I went on a “free tour” package. Basically, you get the airfare and hotel packaged into one, and a free ride to the hotel and airport. Note that taking free tours from Japanese companies means you’ll have to wait for everyone to come out. I had nothing but carry on luggage, and had to wait over 1 hour as everyone came out. I would rather take the train in and I’d be fine. Also, I was the last person to be dropped off. Oh well. My first day in Hong Kong was more of a night. I had a nice “lunch” (it was around 5pm) near my hotel. This place would be where I’d eat every breakfast. I’m not a fan of congee (おかゆ – Rice Soup) so I didn’t order the tour breakfast. Plus, it was probably cheaper and much better in the small shop. They had traditional Cantonese food. I can’t tell you how good it was, but I was brought up on Cantonese food, so I was so happy to have it. Everyday, I had “lo bak go” which is “fried daikon cake” (やきもち）. It is still my favourite type of Chinese food. After a nice lunch, I went out for a quick tour of Kowloon with my parents. We went to see the Peninsula Hotel and the Star Terminal. We even took a quick walk around Sogo. It’s strange to be in another country and see a Japanese Department Store. It was very similar, yet also very Hong Kongese. That night, we went to dinner with a family friend and had a wonderful dinner. If anything, the food is the main attraction in Hong Kong. 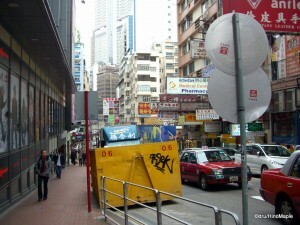 On my second day, I went for a tour of Kowloon, did some shopping, then headed out for a night on the town. My cousin, whom I haven’t seen since I was a child, took me and my cousins (from Vancouver) out for dinner and dancing. We had an East meets West dinner. It was very British in the fact that it doesn’t look good, yet it had some Canton flavours. The most memorable part was the cow’s tongue (牛タン). This isn’t your Japanese cow tongue that is sliced very thin and barbequed. No, this was an entire tongue and you can easily see the taste buds. It looked very disgusting, but it didn’t taste bad. If you ignore the looks, it’s fine. We also ate some pigeon (a little dry and gamey) and then we were off to the club. Our cousin did a great job and reserved a table for us on the dance floor. There was a fillipino band playing rock music and it was great. Lots of old songs from the 90s that made you want to rock out. Needless to say, I drank way too much. The night was half spoiled when my parents came. Oh well. 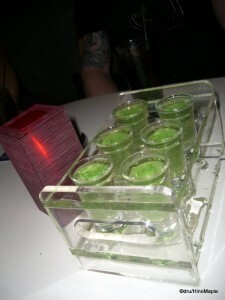 I still enjoyed the drinks. Being a “holiday”, I had to wake up early the next day. I was going to Ngong Ping 360. 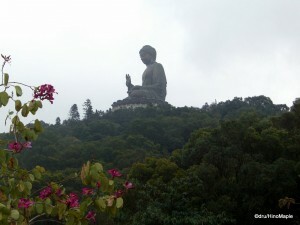 It’s a large national park that has a large Buddhist monastary the largest seated Buddha, outdoors. However, the only way to get there is on one of the longest gondolas in the world and it wasn’t the safest either. Shortly after they opened, it was closed because 2 cars crashed to the ground. They fell off the ropeway. After a year, they re-opened and we travelled on the “safer” version. Hopefully. 🙂 We also had the luxury of travelling with a scared Chinese girl and 2 Japanese guys. Everyone was teasing the girl and having fun. I felt a little sorry for the girl, but I’m sure she felt fine afterwards. The Buddha was nice, but I found the entire trek to get there to be nothing too special. Honestly, I wanted to go hiking in the mountains instead, but I knew I didn’t have the time to go. Afterwards, we had a little time, so we had dim sum for lunch and went shopping at the outlet mall. 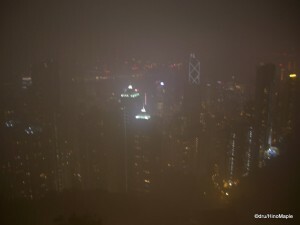 At night, we went to Victoria Peak. It was a nice place, and we took the historical Peak Tram. There was one major problem. It was raining most of the day and the peak was fogged in. We couldn’t really see anything. At night, we could see a little of the city, but not much. It was also very cold. I feel sad that I couldn’t really enjoy it, but that’s life. On my last full day in Hong Kong, I had a lot of free time. I just walked around my hotel as my family went to the wedding. At night, I went to the wedding and had a nice time. Lots of free drinks. I even got to see my cousin who was getting married and a lot of her photos. Apparently went to Hokkaido and a few other places in Japan. The wedding banquet was okay. Just a typical banquet. Showing the bride and groom, lots of drinking, and many drunk relatives. The only drama was when one of the staff dropped a bowl of soup on me and my suit. They cleaned it up a little, but I was already a little drunk, and I felt that I shouldn’t complain. I found out that another cousin of mine is the manager of the banquet hall and that someone got into big trouble. I felt bad, but I didn’t make a fuss about it at all. Plus, the next day I had to leave. I almost couldn’t leave because my drunk cousin (the one that took us dancing) was trying to get me to party all night. However, I still had to pack. Oh well. I did get back to the hotel okay and I did make my flight. 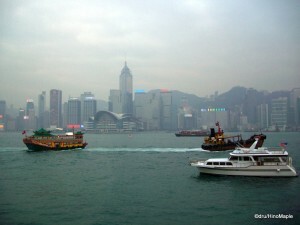 Going to Hong Kong is not difficult, especially from Japan. There are only 2 places to really see in Hong Kong. Ngong Ping and Victoria Peak. The harbour is also a must, but you can do that at any time and it’s very easy. Other than that, food and shopping is probably the main attraction. I’d recommend eating everything you can, visiting night markets, and going to every shop that is unique. Buying old Japanese music, or the most popular albums, is very cheap compared to Japan. However, selection is very weak. Taking the subway is very convenient, but sometimes it’s easier to walk 2 stations. The amount of people and the noise is something that you can’t be prepared for. I started to go crazy because there is noise on every street, all the time. It’s not just the people, but the walk signals emanate a loud ringing noise for the blind. You’ll also see how multi-cultural Hong Kong can be with lots of Caucasians and South-East Asians on all the major streets. Lastly, bring lots of money as Hong Kong can be expensive, depending on what you do. This entry was posted in East Asia and tagged Canton, Cantonese, China, congee, food, Hong Kong, Kowloon, Lan Kwai Fong, lo bak go, motherland, Ngong Ping 360, Travel, Victoria Peak by Dru. Bookmark the permalink.